Crazy kids running around in Ikebukuro. Yes, it is popular enough for the anime to run on Adult Swim, and Yen Press is publishing it here in NA. The first volume should show up here on Members soon for the digital format, if it hasn't yet. Everyone has their own favorite character, I happen to believe that Celty might be the perfect girlfriend. Wait a minute, it might not work out so well now that I think about it. Definitely crazy kids. It seems not everyone likes this one, which is fine by me. Next time would you clarify what you don't care for. Also, the double 'good luck' part still makes no sense to me. It seems like this was a 'drive by' posting and this thread is another random casualty and the post possibly meant for some other subject. I think Durrarra is a great show!My favorite character is Shizuo! So, Shizuo seems to be the strongest man in Ikebukuro. I have seen the anime, and am wondering if the manga is as good. I believe the entire series is based on the light novels. I know that light novels in general don't get translated as much as manga does here. My interest was piqued when seeing that artist Suzuhito Yasuda did illustrations on the light novels. He did the character designs for SMT: Devil Survivor 1 and 2, and I happen to enjoy them personally. My favorite characters are Shizuo and Izaya. I'm not sure on a second anime season, but stranger things have happened. I think the light novels and the manga are both still being made, however I'm not very sure what the chapter to episode ratio would be. I haven't read the manga yet either. ― the author's notes in the 13th volume of Ryohgo Narita's Durarara!! light novel series announced last week that the first arc of the series has ended. ― the PS Vita version will add games such "Puz-Dura!" (Puzzle Durarara!!) and "Rhythm de Perestroika." ― Durarara!! 3way Standoff: Alley V has double the scenario size of the PSP game and that includes three brand new what if routes. ― new Durarara!! TV Anime's promo, chocolate mural posted. - 2nd Durarara!! TV Series' Staff, January 2015 Premiere Unveiled. - Durarara!! Gets New PS Vita Game in 3D in January. - The official website for Durarara! !Ã—2 released three new key visuals for the upcoming second season of the Durarara!! series. - The official website for Durarara! !Ã—2 released a new key visual for the upcoming second season of the Durarara!! series. - The official website for the Durarara! !Ã—2 anime announced additional cast for the upcoming show on Saturday. - The video features the game's world and previews the story. - With the upcoming return of Durarara!! to television screens, it looks like there are going to be quite a few sightings of familiar faces throughout Ikebukuro. 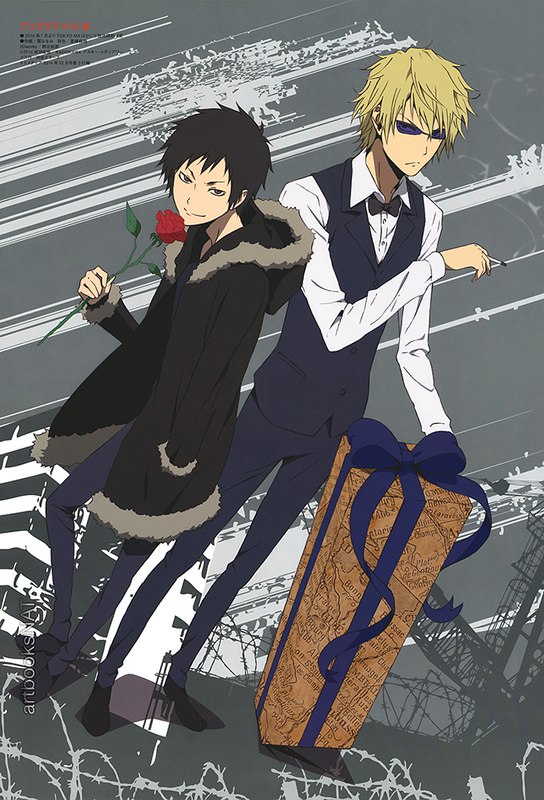 Happy Holidays from Izaya and Shizuo!